The thriller Norman is a new film by Academy Award® nominated director Joseph Cedar. 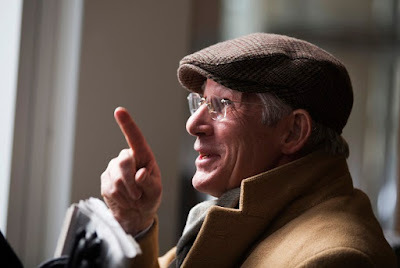 Norman Oppenheimer (Richard Gere) lives a lonely life in the margins of New York City power and money, a would-be operator dreaming up financial schemes that never come to fruition. As he has nothing real to offer, he strives to be everyone’s friend, but his incessant networking leads him nowhere. With his very real connection to the leader of a major nation, Norman is awash in the respect he has always craved. Flush with his newfound feeling of success, Norman attempts to use Eshel’s name to leverage his biggest deal ever: a series of quid pro quo transactions linking the Prime Minister to Norman’s nephew (Michael Sheen), a rabbi (Steve Buscemi), a mogul (Harris Yulin), his assistant (Dan Stevens), and a treasury official from the Ivory Coast. Norman’s kaleidoscopic plans soon go awry, creating the potential for an international catastrophe he must struggle to prevent.